A field survey conducted by a team of marine scientists from the National University of Singapore (NUS) has uncovered toxic bacteria living on the surfaces of microplastics, which are pieces of plastic smaller than five millimetres in size, collected from the coastal areas of Singapore. These bacteria are capable of causing coral bleaching, and triggering wound infections in humans. The NUS team also discovered a diversity of bacteria, including useful organisms—such as those that can degrade marine pollutants like hydrocarbons—in the plastic waste. Dr. Sandric Leong, research lead and Senior Research Fellow at the NUS Tropical Marine Science Institute (TMSI), said, "Microplastics form a large proportion of plastic pollution in marine environments. Marine organisms may consume bits of microplastics unintentionally, and this could lead to the accumulation and subsequent transfer of marine pathogens in the food chain. Hence, understanding the distribution of microplastics and identifying the organisms attached to them are crucial steps in managing the plastic pollution on a national and global scale." This study is the first to examine the bacterial community on microplastics found in tropical coastal regions. The results were first published in the journal Science of the Total Environment on 17 November 2018. There are currently more than 150 million tons of plastics in the ocean. Microplastics, in particular, pose an evident problem as many marine organisms, such as shrimps, mussels and fish, often mistake these tiny plastics for food. Compared to microplastics on land, microplastics in aquatic ecosystems take a much longer time to degrade due to the presence of salt and a lower temperature in the ocean. As a result, they present a habitable environment for marine biota to colonise. Yet, despite their prevalence, the distribution of microplastics along the coasts of tropical regions is not well studied. 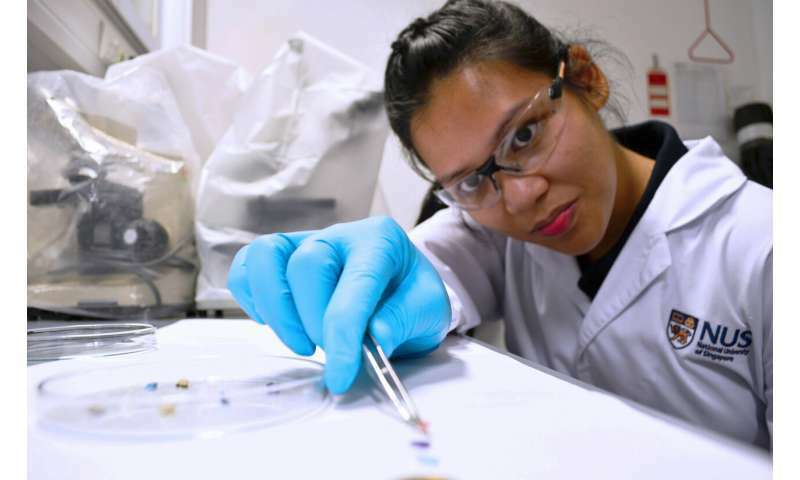 Dr. Leong and Ms Emily Curren, a Ph.D. student from TMSI and the Department of Biological Sciences at the NUS Faculty of Science, embarked on a six-month study to examine the bacterial communities on microplastics collected from coastal regions of Singapore. Between April and July 2018, the research team collected and examined 275 pieces of microplastics from three beaches along the coastline of Singapore, namely Lazarus Island, Sembawang Beach, and Changi Beach. By using high-throughput sequencing techniques, the team discovered more than 400 different types of bacteria across all the microplastics collected. Species of the bacteria Erythrobacter, which is capable of degrading plastic, and bacteria species Pseudomonas veronii, which have been used to clean up oil spills, were found. "Given the predicted increase in plastic waste contamination in oceans, the discovery of such bacteria provides important nature-friendly alternatives for the mitigation of plastic pollution and toxic pollutants such as hydrocarbons," said Ms Curren. In contrast, the bacteria Photobacterium rosenbergii, often associated with coral bleaching and disease, was also identified. The proliferation and accumulation of this bacterium could be detrimental to the coral reefs in Singapore as the southern strait is characterised by multiple coral communities with great biodiversity that are under conservation. The research team also uncovered species of marine Vibrio, a major cause of wound infections in humans, and species of Arcobacter, known to cause gastroenteritis in humans. "As the microplastics we studied were collected from locations easily accessible to the public and in areas widely used for recreation, the identification of potentially pathogenic bacteria would be important in preventing the spread of diseases," elaborated Ms Curren. This study demonstrates that microplastics are a rich habitat that is home to many types of bacteria, including toxic ones. The NUS research team will conduct further studies to examine the origin of the bacteria species transported by the microplastics. This will allow the identification of non-native species that threaten the existing biodiversity, and provide insights on managing the urgent issue of marine plastic pollution.